Unleashed opened in November of 2004. Our journey really begins with our ﬁrst dog Tuxedo who was an Irish Wolfhound cross. At the age of 3, Tuxedo started suffering from the classic allergy symptoms all too common in dogs. She chewed and licked at her paws and the base of her tail incessantly and she had dirty stinky ears and breath that stopped her from being loved by many who approached her. Our vet prescribed a variety of treatments; antibiotics and Prednisone were favorites. They stopped the symptoms while Tuxedo was on them, but inevitably they returned when the drugs cleared her system. We tried all the vet foods (non allergenic formulas) and all the foods out there that we were sold through enticing marketing. Sometimes, a small bit of relief would start but again the old symptoms would reoccur. At eleven Tuxedo was diagnosed with Cushing’s disease. There are three typical causes for Cushing’s disease in dogs: 85% of all cases are caused by a benign tumor on the pituitary gland, 10% of all cases are caused by a tumor on one of the adrenal glands with half of these being cancerous, the remaining 5% of Cushing’s disease in dogs is caused by prolonged use of steroid medication (we believe hers was the result of the abuse of the steroid prednisone!?). We were told she had one year to live at most! We were devastated and she was a mess. She did not have much hair left on her body, she had sebaceous cysts everywhere, and was stinky inside and out. Tuxedo had zero interest in any kibble however was she always interested in our food, or found dead things or cow manure to eat. At this point we decided to start cooking up some human food. She was thrilled and we ﬁgured at this stage in her life, we were just looking for her happiness. Within a few weeks we noticed a difference in her symptoms. She seemed less itchy and was sleeping through the nights…..at least we were and we assumed this was because she was too. Her hair started to grow back, her cysts started to shrink or disappear, and she was shinier than she had been since a puppy. Even her breath was better. So a few months in we were very excited and told our Vet. His response was that he was not surprised! However, not once was a natural diet mentioned, only more highly processed grain-ﬁlled, high-carb foods were offered along with of course the many drugs. We were shocked. How could we have been poisoning our dog for 11 years!? So the investigation began for us. So why do two people who eat local/organic food, don’t use any chemicals inside or outside of the house, and treat ailments with a homeopathic approach, not approach their own dogs health in the same way? Because we trusted that our Vet knew best. Well not anymore. The more we investigated commercial dog food the more we felt betrayed. We were under the impression we were giving the best quality nutrition money could buy, when in fact we were not. Most of the well known pet foods out there were not only unhealthy but detrimental to the health of our pets. Despite clever marketing tactics, these products did not live up to their claims. Not too long ago when big business’ became interested in pet food, the quality of foods began suffering tremendously. Claims of “natural”, “healthy”, and “veterinarian recommended” on the packaging belied the poor quality of the ingredients inside the bag. By avoiding products inappropriately high in grains, containing animal by-products, rendered un-named meats and fats, chemical preservatives, and artiﬁcial ingredients, you are able to add health and vitality to your pets’ lives. When we moved Tuxedo to a diet that more closely resembled what she was designed to eat, she experienced tremendous changes and amazing improvements in health. Tuxedo actually lived another 3 years and died on her 14th birthday. At this time we had Kleine, our 1yr old puppy, and she had only known a home cooked and Raw diet and we wanted to get the word out to others. UNLEASHED WAS BORN. OUR GOAL WAS TO CREATE A STORE FOR THE “WHOLE DOG” INSIDE AND OUT. We wanted all dogs to enjoy natural healthy foods, treats, and health care products free of toxins. We wanted thoughtfully designed gear, beds, and toys that would complement our tastes and lifestyle without being ﬁlled with toxic chemicals or ingredients. Most of all, we wanted all these things in one convenient place so we could spend less time shopping and more time with our best friends. We also wanted to create a community of like minded people and companies that could help in supporting everyone in their “whole dog” journey. 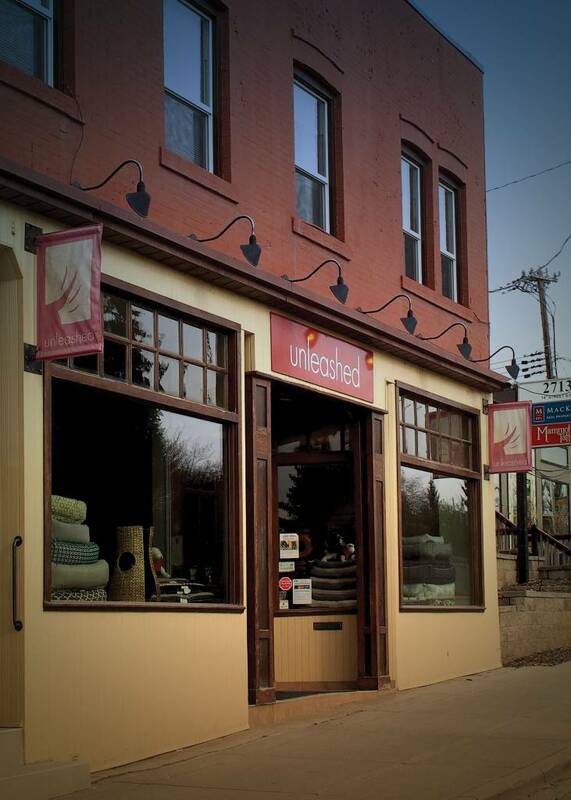 Unleashed has continued to provide the community with healthy, natural pet care products that are consistent with a holistic approach to pet health. All of our products are carefully chosen based on the belief that our animal companions should be treated with the same respect and consideration for natural living that we give ourselves. All of the products we carry are made of natural ingredients and are of the highest quality. We do not offer products that contain substances that could be considered dangerous, carcinogenic, unhealthy, or harmful to the environment. Our goal at Unleashed is to provide our customers with a shopping experience they can enjoy and products they can trust. You can feel good about buying supplies for your pets at our store because we only sell natural products that I would feel good about giving to my own animal companions, Kleine and Stella. Unleashed came out of this experience where we have spent the last 8 years learning and experiencing the beneﬁts and shear pleasure of feeding our two current dogs a fresh, raw, whole food diet, consisting of muscle meat, organ meat, bone, tripe, fruits and vegetables, along with a smattering of other whole foods both raw and cooked! Kleine, at 9 years old, and Stella, at 3.5 years old, are healthy thriving dogs who go to their holistic Veterinarian once a year just to check all is well. I cannot stress the life-saving importance enough of a veterinarian who treats the whole dog rather than the dog’s symptoms. Our passion is deﬁnitely on the nutrition side and we love to share information with those interested in a more natural way of feeding. We have met countless amazing people since opening our doors in 2004 and would like thank you all for your continued support!